Abraham van Dijck (Dyck), Dutch painter and draughtsman. He is thought to have been a pupil of Rembrandt in Amsterdam c. 1650. 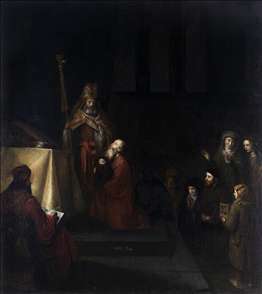 There is no documentary evidence for this, but his earliest dated painting, the Presentation in the Temple (1655; private collection), shows that he had certainly seen examples of Rembrandt s work. He was an eclectic artist, given to following several models simultaneously. This is evident from two versions of Elijah and the Widow of Zarephath; one (1655-60; Copenhagen, Statens Museum for Kunst) is painted in horizontal format in the style of Barent Fabritius, while the other (1655-60; private collection) features large half-length figures in the manner of Nicolaes Maes. In another biblical scene, Benjamin and Judah (1655-60; Chicago, Art Institute), he followed the example of Rembrandt. His best works, such as Saying Grace (1655-60; Hannover, Niedersächsisches Landesmuseum) and the Old Prophetess (1655-60; Leipzig, Museum der Bildenden Knste), show old women either praying or sleeping and confirm that Maes was his main source of inspiration. Similar subjects are represented in the drawings attributed to him (e.g. Old Woman Seated, Holding a Book; New York, Pierpont Morgan Library).